Create an exotic look with this decorative head piece with medallion and coins - great for any style of Belly Dance costuming. 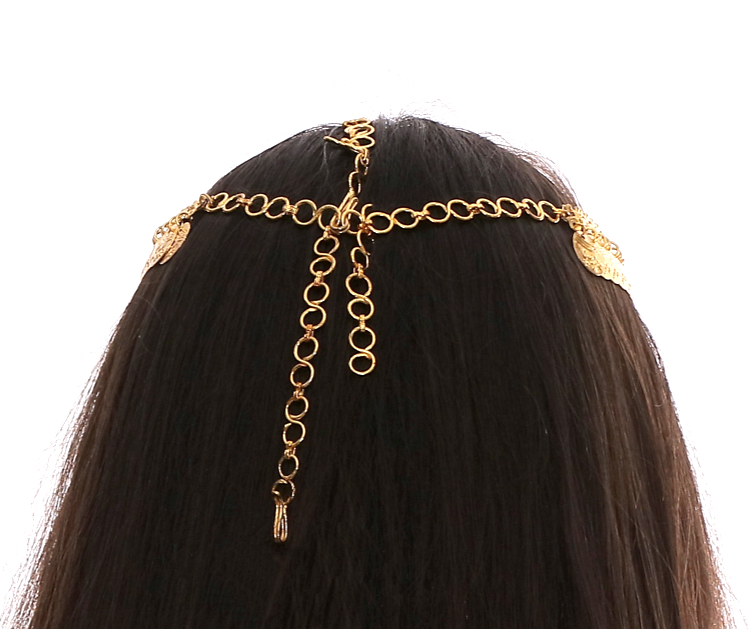 Create an exotic look with this decorative head piece with medallion and coins - great for any style of Belly Dance costuming - Cabaret, Tribal, Tribaret and Fusion. Can also be used for Bollywood, club wear, and more! Approximately 21 inches end to end with adjustable center chain. MADE IN INDIA. It has an adjustable piece in the middle to allow it to hang higher or lower on your head. It was pretty heavy, but after a few minutes I didn't notice it the rest of the night. I've never worn one before so I choose to secure it with a couple bobby pins. It stayed in place all night. If the front is 'too busy' for you, you would easily be able to remove a few pieces with pliers. Overall, great item.